Ever wanted to write a small wrapper for an iOS app that has an undocumented API? Itching to reverse engineer how it communicates with its backend1? You’re in luck! 😎 In the past, my friends and I have used this technique to figure out how to programmatically send and receive Snapchats, months after the application’s release. This lead to one of the greatest stories we tell today. 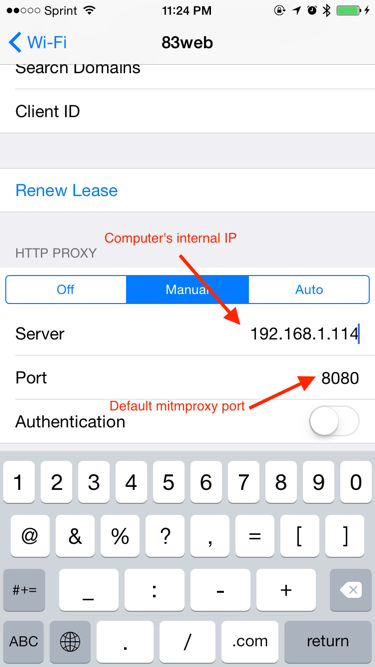 To sniff an application’s network traffic, we’re going to use mitmproxy. It’s a powerful man-in-the-middle proxy that allows you to intercept, modify, replay, and save HTTP/S traffic. Open Safari and go to mitm.it, if everything is setup correctly, you should see this screen below. Install the Apple certificate. Setup is done! Now the fun begins. You may have noticed the output pouring in from of the mitmproxy command you ran earlier. Those are all of the network requests your device is making! You can navigate through the requests with the arrow keys and press enter on any request to inspect it (once in the inspection mode, use h and l keys to switch tabs). If you need any additional help with possible commands, just type ?.